A one-piece swimsuit most commonly refers to swimwear worn by women and girls when swimming in the sea or in a swimming pool, or for any activity in the sun, such as sun bathing. Today, the one-piece swimsuit is usually a skin-tight garment that covers a female's torso, except may be the back or upper chest. Before the popularity of the two-piece swimsuit, and then the bikini, virtually all female swimwear completely covered at least the wearer's torso, and men also wore similar swimsuits. While the bikini has increasingly found popular acceptance since the 1960s, the one-piece swimsuit has maintained a place on beaches to this day. Some people consider a one-piece swimsuit to be more modest than a two-piece bikini.. 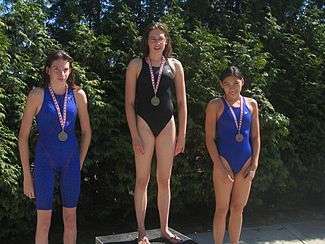 In some situations, the wearing of a one-piece swimsuit may be mandatory or expected, as in the case of school swimming events and international swimming events. By the 1930s the necklines of women's swimwear plunged at the back, sleeves disappeared and sides were cut away and tightened. With the development of new clothing materials, particularly latex and nylon, through the 1930s swimsuits gradually began hugging the body, with shoulder straps that could be lowered for tanning. Hollywood endorsed the new glamour with films such as Neptune's Daughter (1949) in which Esther Williams wore provocatively named costumes such as "Double Entendre" and "Honey Child". Williams, who also was an Amateur Athletic Union champion in the 100 meter freestyle (1939) and an Olympics swimming finalist (1940), also portrayed Kellerman in the 1952 film Million Dollar Mermaid (titled as The One Piece Bathing Suit in UK). American designer Adele Simpson, a Coty American Fashion Critics' Awards winner (1947) and a notable alumna of the New York art school Pratt Institute, who believed clothes must be comfortable and practical designed a large part of her wardrobe which included mostly one-piece suits that were considered fashionable even in early 1980s. This was when Cole of California started marketing revealing prohibition suits and Catalina Swimwear introduced almost bare-back designs. Wartime production during World War II required vast amounts of cotton, silk, nylon, wool, leather, and rubber. In 1942 the United States War Production Board issued Regulation L-85, cutting the use of natural fibers in clothing and mandating a 10% reduction in the amount of fabric in women's beachwear. To comply with the regulations, swimsuit manufacturers produced two-piece suits with bare midriffs, and dispensed with the skirt panels and other superfluous material. The fabric shortage continued for some time after the end of the war. The two-piece swimsuit was making an appearance on beaches by the 1930s. Then in 1946, with post-war shortages still in place, Jacques Heim and Louis Réard separately launched their two-piece swimsuits, one named the "Atome" and the other the "Bikini". Heim's swimsuit was not considered beyond the styles that appeared in the 1930s, which still covered the wearer's navel, but Réard's bikini design shocked the press and public because it was the first to reveal the wearer's navel. At first sales of Réard's bikini were limited. According to Kevin Jones, curator and fashion historian at the Fashion Institute of Design & Merchandising, "Réard was ahead of his time by about 15 to 20 years. Only women in the vanguard, mostly upper-class European women embraced it, just like the upper-class European women who first cast off their corsets after World War I." It was banned in the French Atlantic coastline, Spain, Belgium and Italy, three countries neighboring France, as well as Portugal and Australia, and it was prohibited in some US states, and discouraged in others. In 1951, the first Miss World contest (originally the Festival Bikini Contest), was organized by Eric Morley. When the winner, Kiki Håkansson from Sweden, was crowned in a bikini, countries with religious traditions threatened to withdraw delegates. Håkansson remains the first and last Miss World to be crowned in her bikini, a crowning that was condemned by Pope Pius XII who declared the swimsuit to be sinful. Bikinis were banned from beauty pageants around the world after the controversy. In 1949 the Los Angeles Times reported that Miss America Bebe Shopp on her visit to Paris said she did not approve the bikini for American girls, though she did not mind French girls wearing them. Actresses in movies like My Favorite Brunette (1947) and the model on a 1948 cover of LIFE were shown in traditional two-piece swimwear, which covered the navel, not the bikini. Since the 1960s, the bikini has increasingly found popular acceptance, though the one-piece swimsuit has maintained a place on beaches to this day. Heim's two-piece has fallen out of fashion. 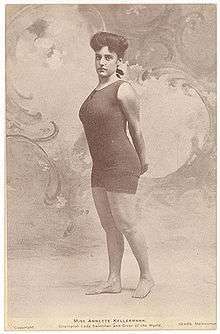 In some contexts till today, a two-piece swimsuit is still regarded by some as immodest and controversial, with a one-piece bathing suit being mandatory, as in the case of most school swimming events. Olympic women's swimming and other international swimming events still prohibit the wearing of two-piece swimsuits. ↑ Sandhu, David (August 4, 2003). "Nottingham: Bathed in nostalgia". London: The Telegraph. ↑ Rubin, Sylvia (July 2, 2006). "Fashion shocker of '46: the naked belly button / But the bikini wasn't a hit until Sixties". San Francisco Chronicle. Retrieved August 19, 2013. ↑ "History". Pageant Almanac. Pageant Almanac. Archived from the original on December 12, 2008. Retrieved November 6, 2008. ↑ Maass, Harold (June 7, 2013). "The controversial bikini ban at the Miss World beauty pageant". Retrieved August 22, 2013. ↑ "Miss America Stops in Paris—Traffic, Too". Los Angeles Times. August 7, 1949. p. 1.